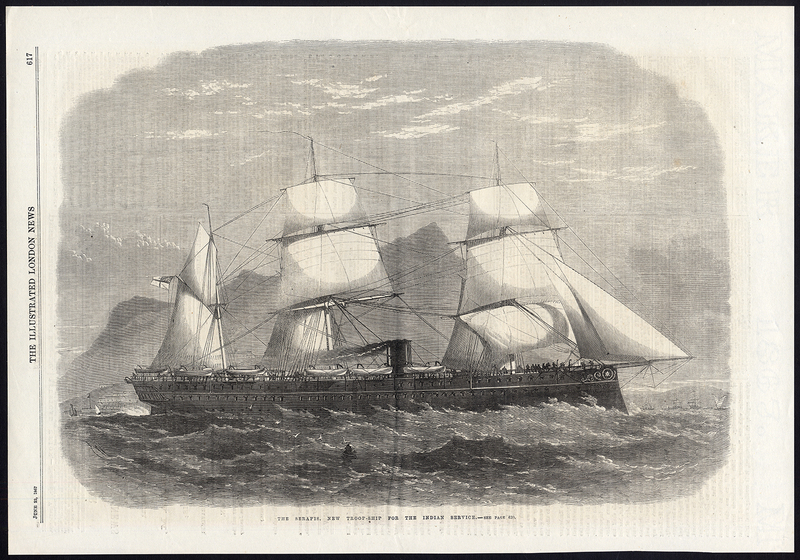 Subject: Plate : 'The Serapis, new troop ship for the Indian service.' This plate shows the British troopship HMS Serapis. English text on verso. Condition: Very good, given age. General age-related toning and light staining/soiling from handling as visible on image. Please study scan carefully. Medium: Wood engraving on vellin paper. Size (in cm): The overall size is ca. 40 x 28 cm. The image size is ca. 34 x 23 cm. Size (in inch): The overall size is ca. 15.7 x 11 inch. The image size is ca. 13.4 x 9.1 inch. Description: This antique print originates from 'The Illustrated London News'. The Illustrated London News was the world's first illustrated weekly news magazine; its inaugural issue appeared on Saturday, 14 May 1842. The magazine was published weekly until 1971, and less frequently thereafter. Publication ceased in 2003. This plate was published 1867.